The delivery of the goods depends on the selection of delivery chosen by the buyer. 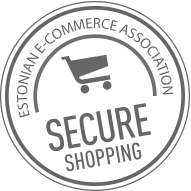 The buyer has the option to choose “Courier service” or “I will pick up myself” as a delivery method in Estonia. All selected variants are completely FREE! But the fastest is the “I will pick up myself” option. In the case of “Courier service”, the representative of Electronics OÜ may specify the delivery info with buyer. If you select DPD courier or SmartPost, you will receive the goods on average 2-3 business days from the date of payment to our bank account. “I will pick up myself” – in case of this choice, you cab pick up goods from Sõpruse pst. 25, Tallinn. If you wish to pick up goods later than the due date indicated on the invoice, do not forget to pay before deadline, as 5 days after the due date, Electronics OÜ will cancel this order after the cancellation we can’t guarantee the availability of goods. If the goods are out of stock and we can not fulfill the order, our representative will contact the buyer and offer the replacement product within 2 business days from the confirmation of the order. However, if the buyer does not wish to purchase replacement product and has already paid for the goods ordered, Electronics OÜ will return whole amount to the buyer (payment provider) within 14 days from the receipt of the payment to Electronics OÜ’s bank account. NB! The goods are given only to the buyer (to the person who is registered as user and the purchaser). It is very important and necessary that all data entered into the user registration fileds is correct and true. The goods are given to the third party only with the prior agreement of the buyer and on the basis of the authorization given by the buyer.